— Call your municipal clerk. Ask her/him to ensure that all citizens are aware of their paper ballot option on Election Day. Encourage them to order enough ballots, or have printers on hand, to avoid Election Day shortages, and allow all voters equal access to paper ballots. Several clerks stated that they have copy machines at their polling places, and can print a paper ballot for anyone who wants one. However, every polling place should have enough paper ballots for their voters, in case of power failure or voting machine breakdown. — Ask for a paper ballot when you vote on Election Day. If poll workers try to convince you otherwise, politely insist on it. — Get the word out. Encourage citizens to ask for paper ballots. Print out this article using the “download to PDF” button at the bottom. Email a link of it to your friends. Write a Letter to the Editor to your local papers, print out flyers and tape/tack them to posts, kiosks, grocery store bulletin boards, etc. Ask “friendly” businesses to put them in their windows or on their counters. Put signs in your yard, on your car, around your town, and get people to help spread the word: ASK FOR A PAPER BALLOT! Why should I vote on a paper ballot? * Voting on hand-marked paper ballots is faster than on DRE machines. Voting machines can cause long lines, sometimes because there aren’t enough available, other times because of “glitches” or malfunctions, or voters’ unfamiliarity with the machine. Voting on a hand-marked paper ballot doesn’t depend on the availability of a machine. You make your selections with a pen and then deposit your ballot in the locked box. 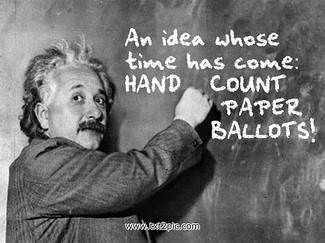 * Hand-counted paper ballots are less expensive than voting machines. Electronic voting machines are more expensive to program, maintain, service and operate than paper ballots, and involve higher ongoing costs to the county. Vendors like Command Central make a high percentage of their income from the programming and maintenance of the voting machines. The Washburn County Clerk stated that the City of Spooner decided to count by hand for the June 5, 2012 recall election rather than pay over $400 to Command Central to have the AVC Edge touchscreen reprogrammed. The point of a paper trail is to be able to confirm the accuracy of vote tallies from an election. The paper trail is supposed to be a tangible, accessible record of actual votes cast. The AVC Edge II touchscreen/DRE voting machine, widely in use in Wisconsin, does not have such a paper trail. Instead, they have a verification system known as VVPAT (Voter Verified Paper Audit Trail). 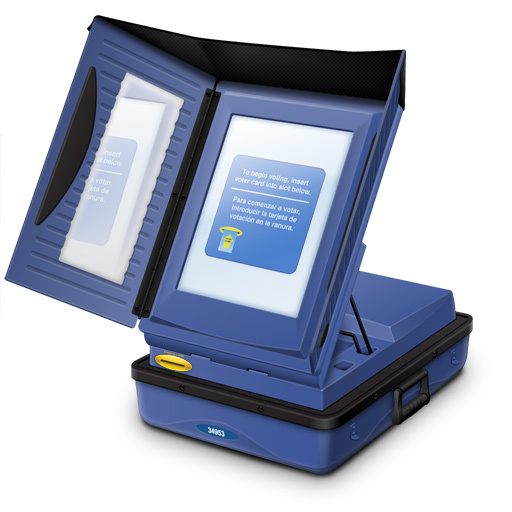 All votes cast on the AVC Edge (and all other touchscreen voting machines) are recorded directly into the memory of the computer. The Edge machine has a small window that appears to the left of the screen, in which the name of the selected candidate is supposed to appear. The VVPAT system puts the onus on each voter to check the name that appears in the window to confirm that the machine has recorded their vote properly. There have been countless incidents of the wrong name appearing in these windows. After the May 8, 2012 recall primary in Wisconsin, WCEP received a report from the town of Cady in St Croix County that when a person voted for one candidate, the name of the other appeared in the window. The voter called the election inspector for assistance, and eventually the correct name appeared in the window so that the voter was comfortable casting her vote. But should we be comfortable casting votes on touchscreen machines, and trusting the Voter Verified Paper Audit trail system, even when the right name appears in the window? Regardless of what name shows up, do we know for certain that the machine is tallying accurately? Can we be certain there is not a second set of numbers being falsely generated within the machine, or that the vote totals are not being altered wirelessly by another computer? The bottom line is that unverifiable numbers on a voting machine print-out is not a verifiable paper trail. Edge Touchscreen Voting Machine. Ask for a paper ballot instead of voting on one of these. * Flaws and security problems with AVC EDGE touchscreen machines. This is just a partial list of the security issues and known flaws in the AVC EDGE touchscreen machines. There are flaws and security problems with all the other “certified” electronic voting equipment in Wisconsin, including the AccuVote, the AutoMark, and all the optical scan machines. Ask for a paper ballot at the polls. See here for a list of Wisconsin counties that use hand count paper ballots.